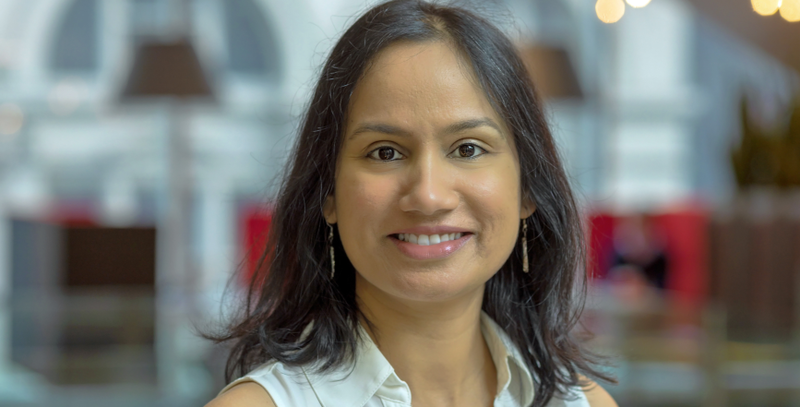 Pooja Malpani joined Bloomberg in October 2018 as the head of engineering for Bloomberg Media. We spoke with her about her new role, in which she leads the team responsible for Consumer Web, Media & Marketing engineering. This includes supporting Bloomberg.com, consumer mobile applications, and the systems that deliver marketing-moving news, data, audio and video to consumers and syndication partners – among other Bloomberg websites. The conversation – which covers her background in technology, technical challenges faced by the media industry, and diversity in the tech sector – was edited for length and clarity. I earned my bachelor of technology in computer science from Model Engineering College in India and my master’s in computer science from Indiana University. After completing my degrees, I worked at a few small companies before joining Microsoft as a software design engineer. I worked there for 9 years and spent most of my time on Microsoft Lync and Skype. Most recently, I was a senior engineering manager at HBO, where I oversaw subscription management for HBO video streaming. This included integration with several affiliates on HBO GO and paywall support in HBO NOW to ensure that HBO streaming could acquire new users and authorize existing users to browse and watch content. When millions of users logged in concurrently to watch a show like Game of Thrones, my team ensured that the back-end user services could handle that load gracefully. What interested you in technology and engineering? As a young girl in India, I loved mathematics, logic, and problem solving and wanted to be a logician. In my teenage years, I learned about computers and programmers and discovered that software engineering and coding was a natural fit for me. I was fortunate to find a booming tech industry and a career that was so well aligned with my interests. How has the technology changed since you started in the field? Today’s problems are more complex and we use different tools and languages to develop solutions. Since starting my career, there’s been an evolution in messaging – from the ICQ client (released in 1996) to Yahoo! Messenger (released in 1998) and Skype (released in 2003). Facebook and Gmail were also launched, creating a platform for users and data to grow over the years, which resulted in an evolution of storage and retrieval technology. The world has become more connected than ever, with more than 2 billion smartphone users. Tech companies that noticed this trend became early adopters and employed mobile-first strategies. Today, there are emerging technologies – including virtual reality, augmented reality, autonomous vehicles, home assistants, location-based services and voice recognition – which are creating unique user experiences. Many businesses are dealing with data on a scale they haven’t experienced before. For example, WeChat, a popular instant messaging client in China that’s also used for banking, shopping and playing games, now has about 1 billion users, and Facebook has about 2.5 billion users using at least one of their apps, including Facebook, Instagram, WhatsApp, and Facebook Messenger. Advancements in technology and cloud services have evolved to support horizontal and vertical scaling to address large data. How has the development of technology solutions for the media industry changed since you started in the field? We’ve gone from analog to digital video and from DVDs and CDs to internet streaming – more than 50% of young American adults use streaming to watch TV as opposed to subscribing to traditional cable packages. Media companies are launching their own over-the-top (OTT) applications that stream content directly to consumers rather than only relying on linear subscription models. For Bloomberg Media, users have direct access to content through Bloomberg.com or our mobile app, and our machine learning algorithms curate content to create a personalized experience for users. Breaking news on Bloomberg’s live blog can cause a spike in web traffic, and the right technology and investment are necessary to ensure that our systems can manage varying traffic patterns in a resource-efficient manner without adversely impacting user experience. Our OTT offering has been part of our strategy for many years and it is available across multiple platforms, including Roku, Apple TV, Google TV and Samsung Smart TVs. The Bloomberg channel on the Roku platform offers the best of OTT, Video on-Demand and Live TV viewing experiences. Bloomberg Media was also one of the first media companies to offer OTT through Amazon Fire TV and was first to partner with Amazon for an Alexa Skill. What are some of the key technical challenges that Bloomberg Media is faced with? We have to be very mindful as we cater to different audiences, and each audience wants to consume their news in different mediums, such as digital, TV, radio, print or live events, as well as different formats, like a summary versus long-form article. In supporting these different formats and mediums across audio and video, there were a number of technical challenges that we overcame by building tools and processes to support the editorial teams. When editors are creating their stories, we provide them with a rich toolset to take advantage of different mediums without complicating their workflow, as well as provide them with flexible systems that render stories in different formats. In addition, we have built sophisticated edit dashboards and data visualization systems that the newsroom relies on for creating, curating and tagging stories. Bloomberg prides itself on speed, and as we accommodate our segmented audience, we must make sure latency is kept in check. What do you see as the future of the media industry and what role does technology play? Currently, we are witnessing a wave of media companies launching an OTT offering to complement their linear offering so they can meet their users where they are. Over the long-term, I don’t think users will want to manage and pay for more than six to 10 subscriptions. We can expect to start seeing some bundled subscriptions, either a la carte or skinny bundles to offset that overhead. I think we’ll continue to see a decline in print news consumption, which means that digital news consumption via podcasts, video, web or apps across all devices will continue to increase over time. As users move from print to digital, advertising will follow. Engagement is going to be a key metric, so, to combat the shift to digital and user churn, many media companies are investing in user retention strategies rather than solely focusing on user acquisition strategies. What’s something interesting that you find people often don’t know about Bloomberg and its engineering department? I originally thought of Bloomberg as a financial services company. But, while there are journalists, analysts, and customer support agents, engineering is actually the company’s largest discipline. Bloomberg is really a technology company that builds software used by finance companies and others. Bloomberg has solid engineering rigor and some of the industry’s best software developers. Bloomberg is a very technical org and that runs deep across departments. I am constantly amazed by Bloomberg’s use and creation of cutting-edge frameworks and software. Bloomberg also uses and contributes to open source software actively. Throughout your career, you’ve been a champion for gender diversity in technology. Are you seeing changes? What else needs to change and how can other engineers at Bloomberg and across the industry help? Bloomberg supports Teach First in the UK, which recruits, trains and places great new teachers in STEM in the schools they’re needed in, as well as partners with the National Center for Women & Information Technology (NCWIT), whose “Aspirations in Computing” (AiC) initiative and community increase female participation in tech careers through mentoring and sponsorship. Bloomberg also has programs such as Returner Circles to support and engage talented women looking to return to full-time roles after a career break. Helping women and other underrepresented minorities as they start their careers is important. Technologists can train and prep them for job interviews. Managers and senior engineers can mentor interns and minorities who work within and outside their company. Technologists can provide advice to students exploring whether to pursue computer science or STEM degrees. We need more male champions and allies to join the cause as the next generation of potential tech leaders pursue their career goals. There’s great promise when some of the smartest people in the world are working to address the gender disparity problem. You once told the Herstory of Tech podcast that you had to get special permission from your dean and parents in order to access the engineering lab at your college in India, but your male colleagues didn’t. How have things changed since then in terms of women getting access to educational opportunities in STEM? I was competing with two other students, in a .NET contest held by Microsoft across Asia in 2000. This was a new technology platform at the time, and the computer labs were locked at 6 PM. Male students could request late access easily, but being female, I was told by the dean that I needed written consent from my father. At the time I thought it was more unfair than outrageous. Apparently, I was the first female student to make such a request. Things are improving, and, on a positive note, investments go a long way in encouraging diversity and supporting the next generation. Efforts like the GHC Scholarships administered by AnitaB.org or the Emma Bowen Foundation Fellows Program, which provides internships for students of color, can change the education system. Just as important, women don’t need special permission to use computer labs today. We are on a good trajectory, and we need to continue moving forward. What’s your favorite thing about working at Bloomberg? Projects move very quickly through the ideation, planning and execution workflow to deliver new features to the customers. This is true even for the most complex initiatives that have multiple stakeholders. I love that about Bloomberg. What’s your favorite aspect of Bloomberg’s culture? Bloomberg prides itself on transparency. You see this in the physical office space, which has glass walls; the television and radio studios and conference rooms are also glass and all employees share an open office plan. Transparency flows through to how people work – two teams are never solving the same problem, employee calendars are shared across their teams and we don’t have redundancies because of this transparency. This post originally appeared on the Tech at Bloomberg Blog.